New REV'IT! Jerez Pro Gloves! I knew I was in trouble as I poured my morning coffee. It was barely 8am but according to my trusty weather app it was already 50 degrees outside. For December in Philadelphia it might as well have been 90. I had a ton of work to wade through and had a pretty rigorous writing schedule planned out, but I knew that it would be criminal to pass up going out for a ride on a day like this. I figured a quick jaunt down to the local Triumph shop for a peek at some new models could not hurt. I called up fellow riding cohorts, Matt and Brandon, who, as it turned out, had the same idea in mind. I swallowed down the last of my coffee, dressed in my two-piece Rev’It! leathers, and headed out to the garage. Out of my small collection of bikes the ’76 CB 550 and ’81 KZ440 were down and out for winter restorations. I ended up choosing my Triumph T-100 over my Honda VFR as the Bonnie is currently wearing knobby tires on her rims, which would help handle all the excess gravel and salt littering the roads. About 30 minutes later the three of us were walking through rows of Italian and British sport bikes. Brandon was drooling over a used Triumph Speed Triple while Matt was commenting on the upgraded suspension of a recently traded Yamaha R1. As for me, I could not decide which I liked more, the new Ducati Hyperstrada or the Aprilia Tuono V4. As we stood around debating the finer points of each machine our conversation soon turned to gear. Brandon was raving about his new Dainese Drake Air pants, Matt was commenting on his Rukka suit not being ideal for his Yamaha R6, and I was offering input on the new Rev’It! Jerez Pro gloves that will be coming out this coming spring. As we all work for a motorcycle gear company, and we are avid motorcyclists, our paychecks are the causality of these conversations. We share similar tastes for premium gear and usually jump on items such as the Rev’It! Jerez Pro gloves. 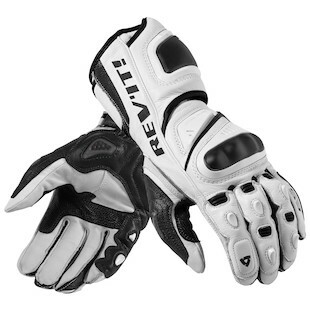 Designed via direct feedback from their Moto GP riders currently using the standard Jerez gloves, The Jerez Pros are some of the most complicated and technical gloves Rev’It! has ever created. 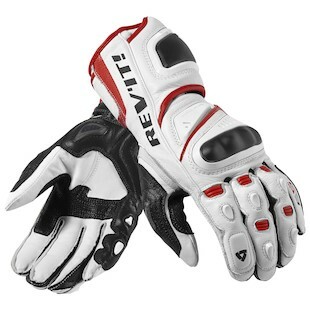 These gloves are very specific in their use and even come with a storage bag to keep them with your track gear. The main upgrades over the standard Jerez include all new TRYONIC impact protection in the palms, a second palm slider, and a pinky slider. The knuckle construction has also been updated to allow for further forward movement. There is TPU armor in the fingers and the palm sliders are a double TPU armor. TPU stands for Thermoplastic Urethane, which sets itself apart from a standard Plastic Urethane with its heat resistant capabilities. TPU offers better protection from the heat generated by friction in the event of a high speed crash and slide. The shell is a combination of five different types of leather including kangaroo leather at the palms, two types of modified goat leather, as well as both standard and synthetic cowhide. No expense was spared in choosing the materials for the shell of the Jerez Pro. Each panel was specifically created with comfort, breathability, and abrasion resistance in mind. Underneath the armor are fine layers of Temperfoam to add both comfort as well as impact resistance. The real impact protection on the Jerez Pro comes from the TRYONIC Impact Protection Technology. TRYONIC is made from Seesoft, an impact absorbing memory foam. It is used on the palms and the cuff to protect your Ulna bone, which runs from your wrist to your elbow. TRYONIC is CE rated and is used in most of Rev’It!’s higher end products. The Jerez Pro is as every bit comfortable as it is protective. The glove features Rev’It!’s Harmonica construction which expands on their “Engineered Skin” philosophy. These gloves are designed to allow your hands to move as freely and as easily as if you were wearing nothing on your hands. All of this is accomplished in line with the gloves protective elements so the rider does not have to sacrifice safety for comfort. Available in four color schemes, the Jerez Pro can be matched with almost any suit. Simple yet stylish in their look, the Jerez Pro is not overly flashy, something most riders will appreciate. 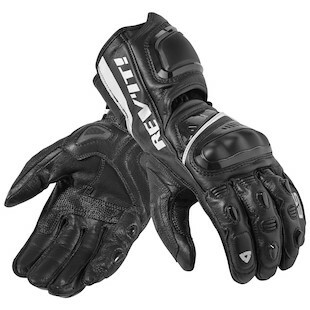 It is a fantastic looking glove that offers class-leading technology derived directly from Moto GP. As we wrapped up our conversation, Brandon, Matt and I decided that it was too nice out to just be standing around looking at motorcycles. We shifted our bikes into gear and took off to hit up some back roads before heading back to our Saturday chores. We all agreed to take it easy due to the salt and snow that was still littering the streets. This “gentleman’s agreement” lasted about ten minutes before Brandon ripped past me on the inside of a long sweeper. For the next five hours we made the vacant back roads of Eastern Pennsylvania our personal racetrack. As it started getting dark we said our goodbyes and all headed off in different directions. As I pulled into the garage I could not help from grinning ear to ear, despite the looming list of unfinished chores. Although there is no substitute for the track, a spirited ride on a 60 degree day in the heart of December can give you enough relief to hold you over until the Spring thaw. It can also fuel ones inspiration for reviewing a pair of all-new Rev’It! Jerez Pro Race Gloves.